When Naomi returned to her own country from Moab with her daughter-in-law Ruth, her old town was a buzz. “Can this be Naomi?” the women said. They hadn’t seen her for over ten years. They never expected to see her again and she probably never expected to see them again either. “the Lord had visited His people by giving them bread”(Ruth 1:6). So she returned. The name Naomi means “Pleasant, delightful, lovely.” But when the woman of Bethlehem called out “Is this Naomi?” she was quick to correct them. “Do not call me Naomi; call me Mara, (which means bitter) for the Almighty has dealt very bitterly with me” (Ruth 1:20). Who could blame her? Life dealt her some bitter blows and Naomi’s spirit was crushed. If you identify with her, read on. Naomi’s small act of faith in returning home did not go unnoticed by her God. He saw what had happened to her (yes, he even allowed it), but he never lost track of his loving purpose for her life. Naomi saw in the natural that blessing and fulfillment were no longer an option. Hope had died with her husband and sons; there had not even been grandchildren. Even so, God had restoration in mind, and he didn’t care how bleak things looked in the natural. It was through Ruth that God began to weave restoration back into Naomi’s life. 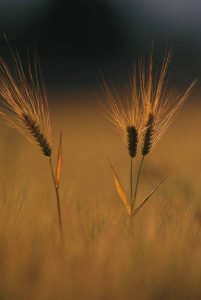 Ruth gleaned the barley harvest in the field of a wealthy man named Boaz, who was a close relative of Naomi’s dead husband. Ruth found favor and the two women were able to eat and survive. Still, God had more in mind than survival. “And may he be to you a restorer of life and a nourisher of your old age; for your daughter-in-law, who loves you, who is better to you than seven sons, has borne him”(Ruth 4:15). “There is a son born to Naomi” (Ruth 4:17). He was counted as her own son. His name was Obed and he was the grandfather of King David and part of the lineage of Jesus Christ. The last years of Naomi’s life were full and rich – who could have predicted it? “Call me Mara”? Maybe you haven’t said it out loud but maybe you have — or something like it. Looking at your life realistically, are there events that are a done deal? No way to reverse in the natural? No way to get past? If so, you can identify with Naomi’s hopelessness and her bitter despair. And now I am proposing that you identify with her restoration. The first thing I want you to consider is that Naomi was not a woman of great faith who “believed God” for better things. She was pretty realistic in assessing her life. She was resigned to disappointment. She blamed God for her condition, even bad mouthing Him to the town’s women. She considered that He is sovereign and could have had the sojourn to Moab turn out differently. She didn’t have great expectations that God would somehow turn things around. BUT HE DID ANYHOW. “For I know the thoughts that I think toward you, says the Lord, thoughts of peace and not of evil, to give you a future and a hope.” God is always for you, always working for your success and restoration. He cares about what happens to you. There is nothing that has already happened to you that He cannot redeem. Nothing. “The things which are impossible with men are possible with God” (Luke 18:27). I don’t know how He does it but He does it. Naomi lived her life pragmatically, making practical decisions based on her best ability. Yet God was behind every one, guiding her in the midst of them the whole way. Have you been called “Mara”? Do you see yourself that way? There is restoration for you. It is not too late. God has planned it and He will do it. Your name may yet change one more time. Thank you, Barbara, for such beautiful reminder. Praise be to God! Each and everyday, we are restored by His hand. And His greatest blessing of restoration is us to eternal life through our Savior, Jesus Christ, our Lord. Thank you for your story. I believe God brought me here on purpose to remind me that restoration is for me as well. You see, my first name is not only Ruth, but my middle name is Naomi. I’ve seen myself resemble both the meaning of the name Ruth as well as Naomi, and today I thank you for reminding me that my name, Naomi, means pleasant, delightful, and lovely! As Naomi did, I also have a husband and two sons, which you could say are spiritually dead at the moment, but I’m believing God is a God of restoration, of the three of them alive in Him. Thank you and may God bless you and continue using you and your ministry. This post has been a blessing to me. I trust God will cause your ‘penning ministry’ to grow and continue to minster life to His body.